Home » Family travel • International living/working • Long-term travel • Travel • Travel books • Work/Life/Travel Balance » I Want to Move Abroad. Where Do I Start? I used to get variations on this question every month when I wrote about international living on my blog and started reporting from a residence in Mexico. Once I started showing how much my monthly living expenses had dropped by living abroad, that got a lot of readers asking questions. Often the same questions. How do I get a job? How do I pick a place? How do I find an apartment? Is it safe there? First of all, change any prevailing mindset that everything you need to know can be gathered up for free online. Sure, if you have lots of free time you can find a lot of articles, but many are out-of-date, short on details, or just plain wrong. I’d say the best of what is available for free is on ExpatExchange.com, but a lot of the material is more about coping with cultural change than the nuts and bolts of moving and getting set up. Good information, solid information that’s reliable, costs money. Not a fortune, but not free either. If you’re going to ask where and how you can live on a few thousand dollars less a month than you’re spending now, be willing to invest some money to get you there. Spend a little, save a lot. 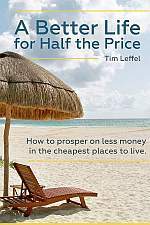 After years of fielding reader questions and writing freelance articles, I put out a book on the subject, A Better Life for Half the Price. So if you spend the equivalent of a couple cocktails in a bar and then read that book, you’ll know more than you thought you needed to go to get things rolling. It covers all the major topics, then drills down into specific destinations as well. It’s available in paperback, e-book, or audio book. See the options here. If you would like more interaction, there are two packages with the e-book, the latter including some one-on-one phone time with me. 2) Subscribe to International Living magazine. Sure, they’ll wear you out with sales pitches and they’re in bed with some people they recommend for purchases, but they’re still the best print subscription resource: International Living. That takes you to the order form, where it’s $49 a year or $89 for two. 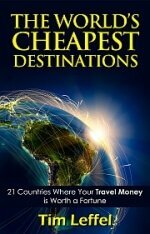 This is probably the best investment you’ll make in living abroad for less that’s ongoing. Each issue will fill you with ideas and confidence and show you this is not some wacky idea that only few fringe outcasts indulge in. There are millions of Americans, Canadians, and Brits living in cheaper countries by choice. If you need a stronger hard sell though, browse around their site and they’ll pour it on thick: they’ve obviously got a few experienced direct-mail copywriters on staff. Hype aside though, what’s in the magazine is well-researched info with real prices on the ground, usually from writers who are living in the places they’re writing about. 2) Look into other books. Assuming you’ve already got mine, check out other books that are more specific. Before I moved to Mexico with a daughter, both my wife and I read The Family Sabbatical Handbook and found it helpful. I’ve since met a dozen other parents who have used it as well. Follow the Amazon recommendations that pop up alongside mine and you’ll get to books like Getting Out and How to Retire Overseas.. If you already know where you want to go, dive into a book for that country, if it’s available. Moon Handbooks used to put out a lot of good Living Abroad guides, like Living Abroad in Thailand. Do an Amazon search for the country you’re interested in and you’ll probably find more. Naturally you’re going to find more info on living in Costa Rica or Mexico than you will on some obscure country where you’re the only expat, but if there’s a sizable number there’s probably a book on moving there. If you come up empty on physical books, start trolling for e-books. Often you’ll find something on International Living or Amazon—especially since Amazon has made it so easy to publish micro-targeted e-books, but if not keep looking. Often a locally run website or expat message board can point you in the right direction. Sometimes these e-books are pricey: the author is giving away insider information to the few who really want it and can charge a higher price. Again though, if investing 40 bucks saves you $400 every month on rent or $4,000 on closing costs, isn’t that worth it? Anybody can post anything on the web without getting called out on it, so there’s a lot of misinformation and just plain misleading advice that will take you down the wrong path. I’ve found ExpatExchange.com to be more reliable than most overall. Also look to living abroad articles from Transitions Abroad. If you can find a local expert who really knows his/her stuff, then embrace their site and use it as your main guide. Most countries have at least one really good authoritative site you can trust, like Mexperience for Mexico or Travelfish.org for much of Southeast Asia. Check these sites to uncover blogs written by locals, often foreigners talking about what it’s like living there: Expatsblog.com and BlogExpat.com. You can also find some good videos on “living abroad in _____” on YouTube, including a few of mine like this and this, but you may have to wade through some clunkers to find some good ones. Settle in with some popcorn. The best resource can take more digging but can be a gold mine: local expat message boards. Sometimes these are online bulletin boards with archived questions and answers, sometimes they are Facebook groups. Even if a place only has a couple hundred foreign residents (like where I own a home in Guanajuato, Mexico), there will likely be one or both. You can ask a hundred questions and read a hundred books, but there’s no substitute for getting out there and giving a place a trial run. Think you might want to live in Central America but you’re not sure where? Get a one-way flight to Guatemala and start moving. You’ll get a real sense of prices and you’ll find out where you would truly be comfortable. I spent a month in Guanajuato with my family a year before we moved here for our sabbatical. I knew from my travels which places I definitely did not want to live in, even when they were cheap and looked great on paper. They just didn’t have the right feel. The only way you’ll know that is if you pack a bag and go. Every place has its pros and cons and the more research you do, before and on the ground, the more you’ll be ready to find your perfect climate, understand how local prices work, deal with resistance from friends and family, handle your banking, and start getting your list together of nagging details to take care of. Then take off! Read everything you can, books, websites, on places that interest you. Get a passport. Check tell Wikipedia page “Visa Requirements for U.S. Citizens” to see what’s needed to travel there and length of stay(or the corresponding page for your particular country). Use Booking.com or Airbnb to find places to stay in your budget range. Use Skyscanner to find affordable flights. Go. Try to stay an amount of time necessary to decide if it’s for you. Don’t stay in your room, explore. And if you don’t like it that’s ok. There are other places that might appeal. Almaty, Kazakhstan was overwhelming to me. I liked Kutaisi, Georgia at first, not so much after a couple of weeks. Like Batumi, Georgia much better. Am in Bishkek, Kyrgyzstan now, liked it from the start, even more after three weeks. You never know from just reading and some publications are selling dreams. Nothing like being there. All solid advice but # 4 is the most crucial. Visit your destination and then do it again to get a feel for all the seasons you’ll have to brave in the future. I can only speak for SE Asia but places look very different in the rainy season compared to the cooler high season for tourists “hmm, I don’t remember there being a lake here…”, and then there’s the blazing hot season preceding the rainy season. Even if you’ve been visiting for years, it likely won’t prepare you for the obstacles you’ll be facing as a resident, so be prepared for that. Still, at the end of your life you don’t want to be saying “I wish I had done it back then…”. A lot of truths in here. I got a lot of bad advice that I later learned was tied to a vested interest or even sabotage. And often what’s free online requires so much vetting that it can wear you out. Find people who live there already. They usually don’t have any reason to sugarcoat things. There’s a Sufi saying, “only a fool trusts anothers word over their own experience”. Go visit! It’s the best way to get a feel for place and see/feel first hand if it matched your desires. Reading can clue you in but first hand experience is crucial…I’ve been to highly recommended places I knew instantly were not for me. Enjoy the journey! Great read! My wife and I are looking into living abroad for a year. Very helpful article. Are you still living abroad in Mexico? My main question is regarding visas and the ability to stay in a location for a whole year. I guess is depends on the location that you choose. Any insight on different visas which can be obtained?